The holiday cheer never has to end with Playtech's new online slot machine. “A Christmas Carol” has returned once again in this inspired casino game released in December of 2012. This Dickensian reinterpretation is entertainingly quirky and lucrative to master. 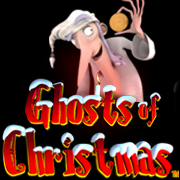 “Ghost of Christmas” opens with a comprehensive animated segment featuring a three-dimensional re-hash of the story that is as educational as it is hilarious. With character designs that are uniquely original, this slot machine delves into an artistically post-modern territory. There is no skimping on the high-definition quality of the graphics. The game itself is a formulaic masterpiece of gambling. Featuring five reels and a total of twenty pay-lines, this game has an astonishing maximum bet of $10,000 per round when the pay-lines are upped to $500 each. Every icon is based on the lore of the tale and the illustrations are all sharp and recognizable. The ghosts are wittily included as characters, even Past, Present and Future. The Ace, King and Queen show up as do Bob Krachet and Tiny Tim. Scrooge himself serves as the wild symbol while Jacob Marley is designated as the scatter icon. Free spins are activated by lined up at least three scatter symbols and these rounds incorporate a triple multiplier. Playtech also added a profitable bonus game that is triggered by hitting just three of the clocks. Prizes are hidden among a series of desks, wrapped gifts, and gravestones for the player to uncover. Variations on the bonus game are based on which ghost activates it each time. Overall, this video slot machine is stream-lined for high-rollers to bet at a rapid pace. The visuals flow seamlessly and the ease of playability is astounding. The game utilizes an off-beat irreverent style to create an addictive gambling framework that is relentlessly engaging. Every click is worth a laugh and could be worth a large sum. The layout of the game is pretty standard and most of the action is conducted left to right with the exception of the green Marley icon that reads both ways. The highest jackpot consists of 10,000 coins and can be earned by getting five linear Scrooges. Using the triple multiplier, fifteen free games can be won with a single spin. Rounding out the experience is a thoroughly delightful soundtrack based on the original carol. It is expansive enough to avoid repetitiveness but the basic sound effects do not vary as often as they should. Still, the experience is captivating and the software itself is secure and free of glitches. For more online casino games click here.